A two-way review and rating system for both guests and hosts to build a credible platform. Both can write reviews and rate their experiences during the time of stays. Makes it easy for global customers to judge a vacation rental property prior to the visit or final booking. Integrated currency converter to support multiple foreign currencies from global guests. The feature helps you build a global business without worrying for dynamic currency conversion rates, and you can accept online payments in almost any global currency. 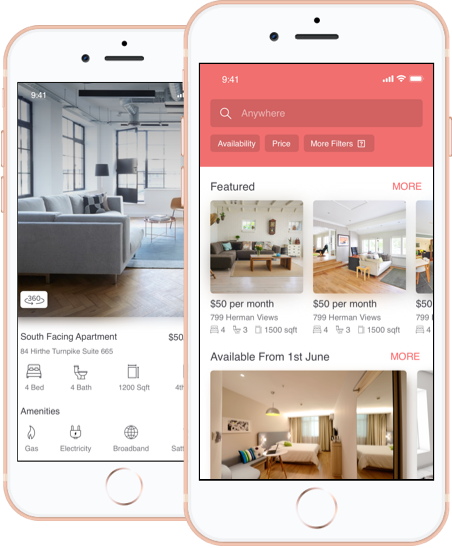 Native Airbnb clone apps for Android and iOS. Both guests and hosts get their own mobile apps on both platforms. 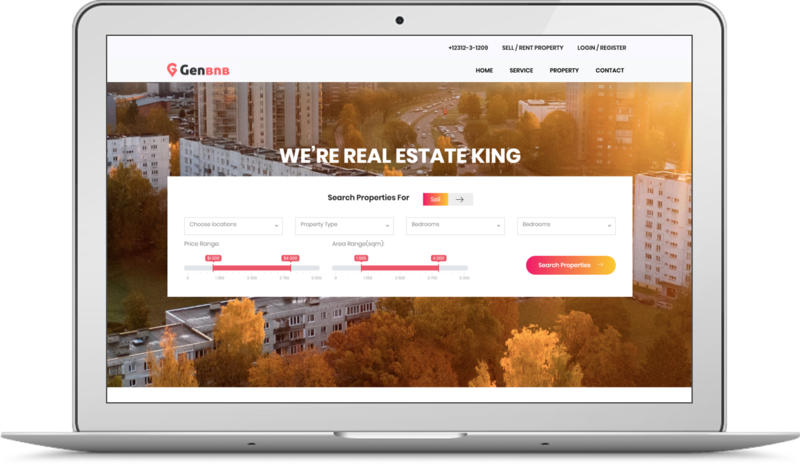 Our best Airbnb clone makes browsing and booking experience personalized with a seamless synchronization to the web counterpart. The responsive web design makes it possible to enjoy an app like experience while browsing the website on mobile or tablet devices. We left no stone unturned to drive as many customers to your business, even without downloading your mobile apps. Advanced search filters to let the guests find their favorite stays in their preferred locations as quickly as possible. Multiple aspects to filter out the most suitable options as per the set conditions. Supports multiple currencies of the globe to let your business expand globally with foreign guests being able to book without any currency conversion issue. Global payment gateways do their job seamlessly. A guest-to-host and vice-versa messaging system for a seamless communication channel. It helps guests and hosts to share locations, landmarks, confirm check-in time, or arrange a pickup. 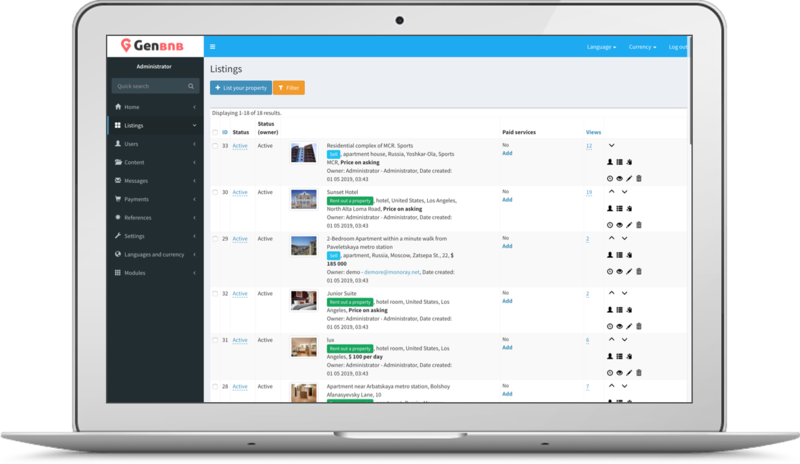 Guests can bookmark their favorite listings and also share it on social media platforms. Helps in planning a trip with a collaboration. Encourages to convert a wish-lists in an actual trip. What can you do with Airbnb Clone? Commission from Hosts: Airbnb clone lets you charge commission from hosts upon every booking done through your marketplace platform. Transaction fee from Guests: It also lets you charge a percentage cut of the booking amount as a transaction fee from the guests on every confirmed booking. Note: The payment from guests is received by the Admin and is transferred to the hosts after a set time when guests do the check-in. A dynamic Admin panel at the back-end designed to manage everything from bookings, commissions, refunds, to addition of new hosts on the platform. Admin Panel gives you ultimate control over your business. You can manage all type of users: hosts, guests, and others. Approve only verified hosts for the bookings. Verifying hosts’ social media profiles and submitted IDs. Manage host accounts and host pay-outs. Manage feedbacks, abuse reports, and other grievances. Airbnb clone script is an all-in-one one-step solution to start a vacation rental business in a quick time. The complete package provides both responsive web scripts and mobile apps to target every possible prospect in the highly profitable tourism industry. 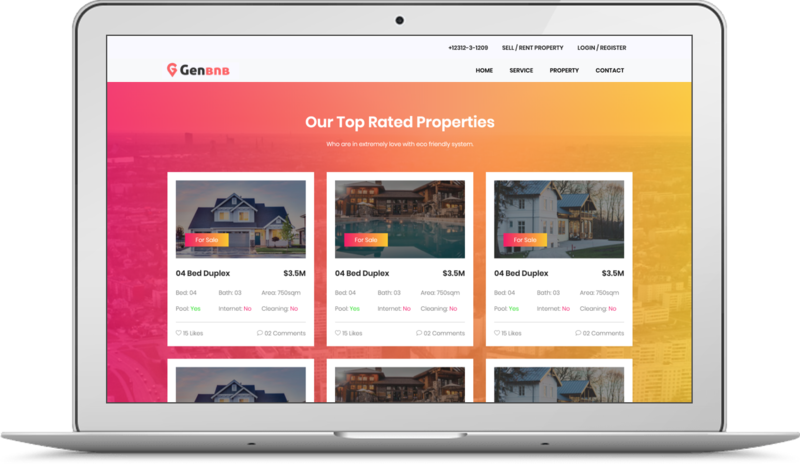 With integrated reviews and rating systems, you can develop a credible rental business trusted by global customers through peer-to-peer integrity. You can also start a hotel aggregator platform listing popular hotels and resorts to be discovered by local and global customers. If you own some properties across different locations, you can launch your own home-stays or hotel chains instead of listing others. Or you can also do both. You can start a car rental business using the same Airbnb clone script with certain tweaks. You can launch a boat rental service following the same revenue model and business flow. It is one of the best Airbnb clone scripts built on modern web technology. It is secure, robust and scalable in all regards. We have used the most efficient version of the LAMP stack (Linux, Apache, MySQL, and PHP) to build the platform. Laravel 5.2 Framework for the back-end. Queues concept for sending an email and push notifications. Where can I see the demo? Every 60 days we push a product update with some new features along with existing bugs and issues fixed. It will be upgraded to your server free of cost. If you don’t require the new feature – you can simply patch the bugs by replacing the latest patch files. Can I use the same software for another industry or niche? Can you show us some examples of people using your software? Can I buy regular license and then upgrade later? Yes, you can buy the regular license ( web version first ) & then later upgrade to Premium edition which includes mobile apps. Please check the product demo before you buy.